This work-in-progress shot was taken by Kelly J. as he began his Fabric Spray Paint project of painting a pair of armchairs Charcoal Gray. You can change the color of armchairs, couches, love seats, cushions and more with Simply Spray Upholstery Paint. 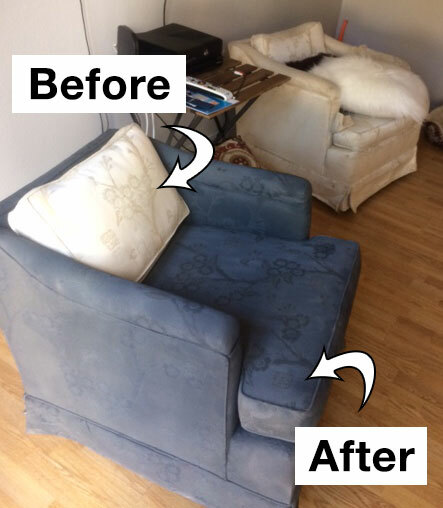 In this project, Kelly used our Charcoal Gray Upholstery Paint to change the color of his furniture. 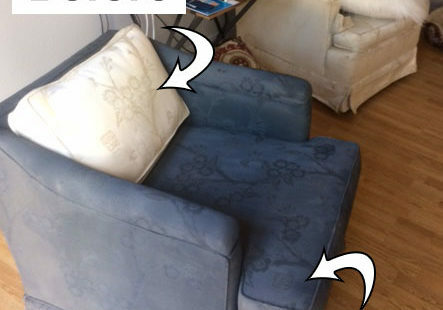 The photo above shows the gray fabric spray paint that has been applied to the body and seat cushion of the chair. The original color of the armchair was ivory white, as shown on the back cushion of the chair and the armchair in the background. We usually recommend six cans of Upholstery Fabric Paint for one armchair like this. Depending on the absorbency of the fabric, the amount of fabric on the chair, and how many coats of paint you need to use, this number can vary. We strongly suggest you OPEN ONE CAN AT A TIME when doing a project. You can return any unopened cans you did not need. We cannot refund opened cans. As you can see, the original fabric of the armchair contains a floral pattern. As a result, when the armchair is sprayed with the Charcoal Gray Fabric Spray Paint, the pattern is still visible. This is because Fabric Spray Paint acts as a dye. All-over patterns may still show through your painted fabric. Keep this in mind when purchasing paint for your project. Because Fabric Spray Paint acts like a dye, it will only work if you want to make your furniture fabric darker. Therefore, you cannot go from dark to light with this paint, only light to dark. We love getting photos of new projects from our customers. As you do your Fabric Spray Paint project, be sure to take pictures of your process and send them over to us, and we will send you your own personal 20% OFF coupon to use on your next purchase. Click here to submit a project. Click here to browse all our upholstery paint colors. We look forward to seeing your projects.